So I was driving my truck this weekend and it started ticking worse than it had before. I have been planning to rework the heads, so I dismissed it in lieu of that. Fast forward to today, which is Wednesday, and while I was driving to work this afternoon I had a sudden loss in power and the truck started dying when not feeding it gas. It also later has developed more of a banging sound rather than a tick, bad enough to where I parked it at the gas station to tow it later. My truck also burnt oil before this, it would go through about two quarts in 3 to 4 weeks. So, to get to the point my question to you guys is whether you think it would be more worth it to rebuild the heads or buy a junker Engine. I found a 400 cubic inch at my local junkyard, it has around 70k and runs fine by their standards and not burning any oil. They are selling it for $1,000. I have the tools to install it myself. The other option, rebuilding the heads I would do at a local engine machine shop, where they would machine the heads for around 200 or rebuild the heads for 325 per head. My engine has upwards of a hundred sixty thousand miles on it. I have heard old wives tales that a 400 has history of overheating? Honestly, my budget is probably around 1200. What would you recommend? TL;DR I need new engine, or heads, is rebuilding my old heads better than buying a junker 400? Re: Problems with my 350. Rebuild or swap? Doing heads alone will really amplify oil burning IMO. For your budget I think the swap would be less expensive and give you the better outcome if in fact that engine is really fine... For the record I have had engines that really had no signs of burning oil go through a quart every 800 miles... Best of luck in whatever you decide to do. Also the 400 is externally balanced so you need to use it's flexplate and harmonic balancer. If your engine is "banging" then you have more problems than the heads. You need to tear down the whole engine to determine what the cause is. Just doing the heads is a waste of money without knowing what the bottom end is like. I would probably also put in the 400 for your budget. 400 engines have a tendency to run hot due to the fact that they have thin cylinder bores and there is no circulation of coolant around the cylinder casting because they are Siamese cylinders. Also the heads like to crack on the small block from the late 70s thru the mid 80s. Also be aware that 400 heads are unique because they have steam holes drilled in them that non 400 engines do not. Try to find a new or rebuilt long block 350...in the medium and long term this will be your most cost effective path. See what the pricing is from local Chevy dealer, parts shops, and internet. Ask for one with 4-bolt mains. On a high mileage engine, replacing the heads will just cause the rings to blow more oil than the valve guides were leaking in the head...been there done that. Although the 400 is a respectable engine for basic truck service, getting an unknown one from a junkyard is asking for more trouble in the short term. Also, I have to imagine the accessory bracketry may not be common between your 350 and the 400...it will make your life easier for the swap out. If your budget pushes you toward the 400, see if you can get them to do a compression test, or better yet, let you do it. Your engine needs more than heads rebuilt and will exceed your budget. The 400 may seem like it's within your budget but it won't be and you will again exceed your budget for a used potentially problematic engine. 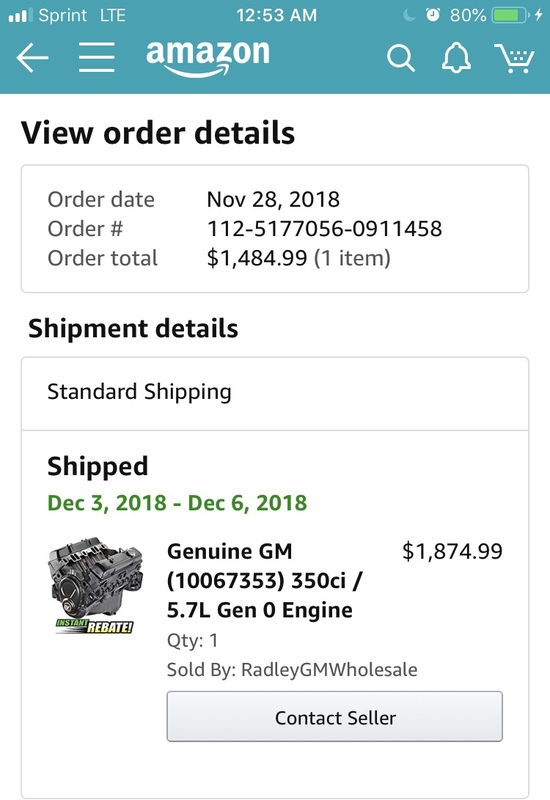 Get a crate engine and be happy. Where are you located? $1000 seems like a lot for a junkyard 400 that is at least 30 years old, and has very lame smog heads on it. If I was going to buy a junkyard 350 I would look for a 96+ Vortec 350, which would have Vortec heads (much better flow), roller cam, one piece RMS, and would have spent its life fuel injected (usually much less wear on the cylinders because of consistent mixture). To switch to a carburetor you would also have to invest in a Vortec intake manifold, electric fuel pump and maybe a new flex plate, but other than that it should drop right in. There seems to be quite a few wrecked pickups, Tahoes and Suburbans from the late 90's in the junkyards near me.